Earlier today, we wrapped up our webinar Tactics for Library Job Hunting in a Tough Market with Jeanette Woodward. We want to give a special thanks to our sponsors, LearningExpress and Mango Languages, for making this session possible. 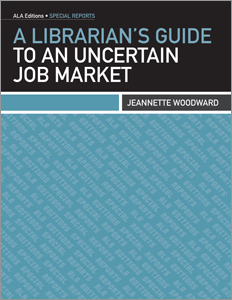 Jeannette Woodward, author of our special report A Librarian’s Guide to an Uncertain Job Market will host the webinar “Tactics for Library Job Hunting in a Tough Market” on October 20, 2011 at 1:00 p.m. Eastern Time. Thank you Mango Languages and LearningExpress for sponsoring the webinar. Register today! Below is a sample from the report. We are offering $5.00 off the special report, in all formats print, eEdition, or combined. Visit the listing in the ALA Store and use the coupon code LGJF11. Offer expires October 17. 2011. UPDATE(Oct 3): Bigger savings! Use this coupon code for a 50 percent discount on any format.